RainForest Park Cebu is a popular entertainment complex that features restaurants, an obstacle course, a spa, a bar and much more. The outdoor activities here are a must-try and the adventure jungle experience are quite popular amongst the tourists. Inside the rainforest, there are a set of obstacles that you need to overcome which is a wonderful experience. RainForest Park Cebu is very well-maintained; the staff members are friendly and ensure that you have a pleasant experience with your family. 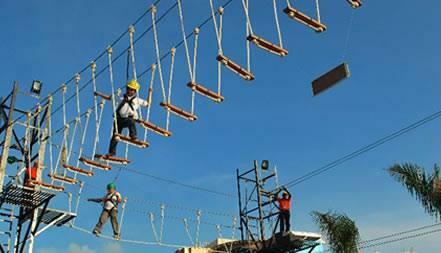 How popular is Rainforest Park Cebu? People normally club together Taoist Temple and Cebu Heritage Monument while planning their visit to Rainforest Park Cebu. I AM PROFOUNDLY SORRY TO SAY THAT I HAVE BEEN THERE MYSELF AND TOOK CLEAN PICTURES FOR YOU GUYS IT IS DEFINITELY CLOSED. ..OUT OF BUSINESS. ALL THAT I WAS ABLE TO GET WAS A BUSINESS CARD OF A MAN THAT I COULD CONTACT TO FIND OUT WHAT ARE THE NEWS? THEY TOLD ME THAT RAINFOREST REOPENED IN CARMEN CEBU AND I PROMISED BY THURSDAY OF JUNE 14/2018 I WILL GET A CLEAR ANSWER FOR YOU GUYS. I AM GOING TO CARMEN CEBU. ..OUT OF MY COMFORT ZONE. this place used to be nice way back 2014 but now they close it. With so many things to see inside.